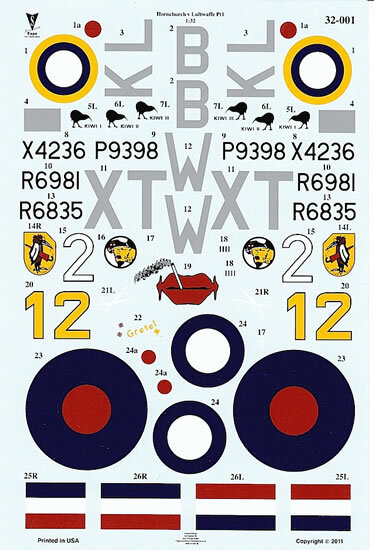 Both sets contain 1 x waterslide decal sheet of national markings, code letters and other aircraft-specific markings, and detailed A4 full-colour marking and painting guides. 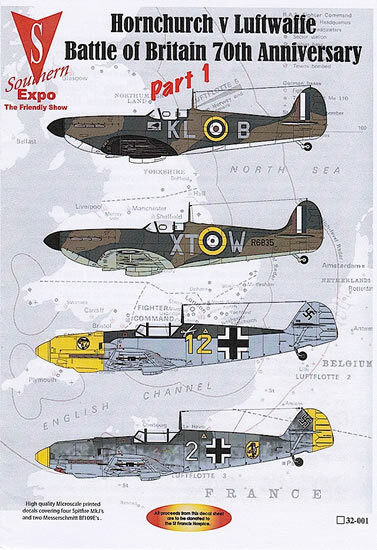 Part 1 contains markings for six different aircraft, and part 2 for four aircraft. 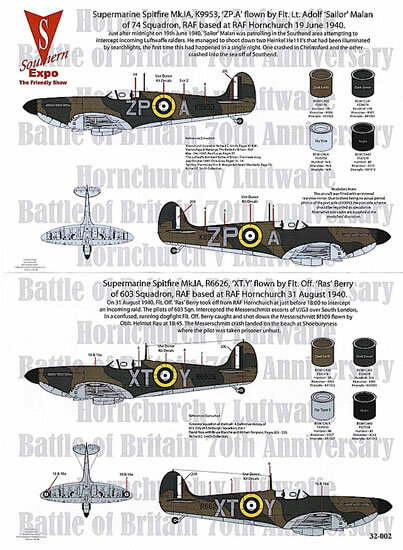 Featuring seven RAF Spitfires and four of their Luftwaffe victims, the 1/72 and 1/48 sheets were very positively received; the 1/72 sheet is now sold out. 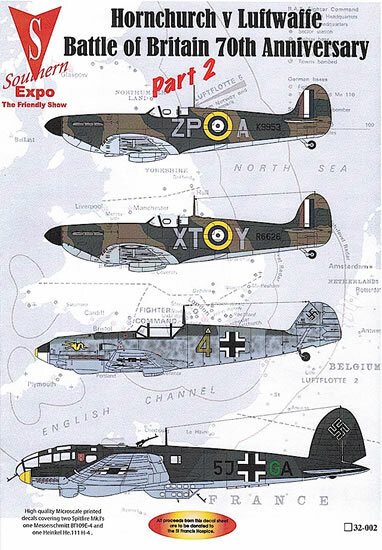 This has encouraged Southern Expo to release the same decals as two 1/32 scale sets, featuring all of the aircraft from the original release. Spitfire Mk.Ia, P9398/KL-B, ‘Kiwi II’ flown by Pilot Officer Al Deere of No.54 Squadron, RAF Hornchurch, 9 July 1940. Spitfire Mk.Ia, R6981/KL-B, ‘Kiwi III’ flown by Pilot Officer Al Deere of No.54 Squadron, RAF Hornchurch, 15 August 1940. Spitfire Mk.Ia, X4236/KL-B flown by Pilot Officer Al Deere of No.54 Squadron, RAF Hornchurch, 31 August 1940. Spitfire Mk.Ia, R6835/XT-W flown by Flying Officer Brian Carbury of No.603 Squadron, RAF Hornchurch, 31 August 1940. Messerschmitt Bf 109 E-1, W.Nr.37712/‘Yellow 12’ flown by Feldwebel Ernst Arnold of 3./JG27, France, 30 (or 31?) August 1940. Messerschmitt Bf 109 E-3, W.Nr.1160/‘White 2’ flown by Oberfeldwebel Johan Illner of 4./JG51, 31 August (or 9 July?) 1940. Messerschmitt Bf 109 E-4. 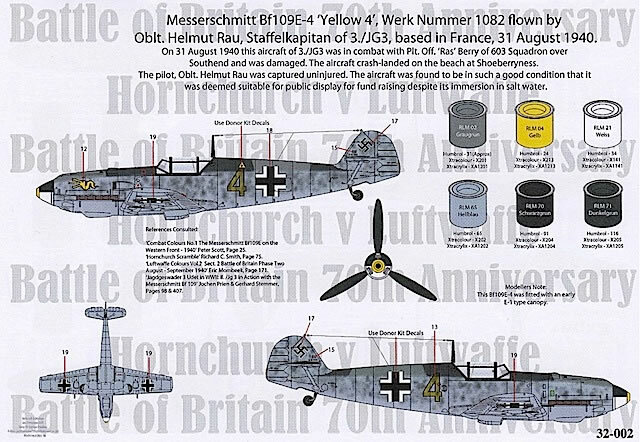 W.Nr.1082/‘Yellow 4’ flown by Oberleutnant Helmut Rau, Staffelkapitan of 3.JG3, France, 31 August 1940. Heinkel He 111 H-4, W.Nr.2894/‘5J+GA’ flown by Leutnant Erich Simon of KG4, France, 18 June 1940. Everything that I wrote about Southern Expo decals in the “Northern France Forays” review also applies to these releases. The instructions are excellent, in terms of both the comprehensive painting and marking guide and also the detailed information that is provided about each aircraft and its pilot or crew. 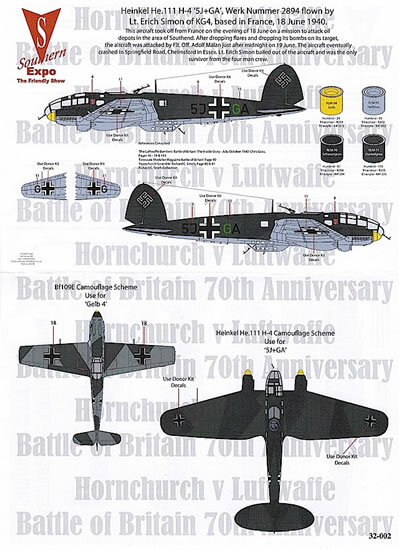 Interesting tidbits abound, and the links between each RAF and Luftwaffe aircraft are clearly explained. There are a couple of inconsistencies in some of the information provided (such as dates) that might have been avoided with more thorough proof reading, but this is a minor complaint only. The decals have been printed by Microscale, and appear to be very good in all respects. I haven’t checked them for accuracy against photographs of the original markings, but Southern Expo has provided enough material on each aircraft that modelers wanting more information should to be able to find this fairly easily. 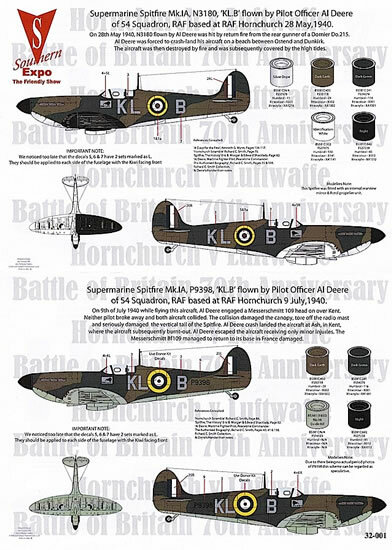 I recommend these sets highly to large-scale modelers with an interest in the Battle of Britain. 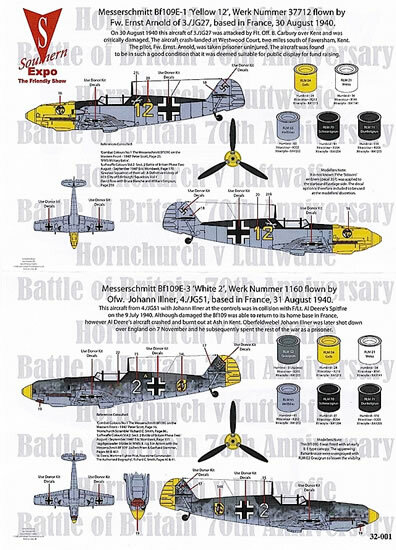 The combination of interesting, closely connected aircraft with thorough research and excellent decal production will, I think, make it hard for modelers to limit themselves to just one subject from those on offer. If ever there was an incentive to embark on a 1/32 ‘dogfight double’ project, this is it!